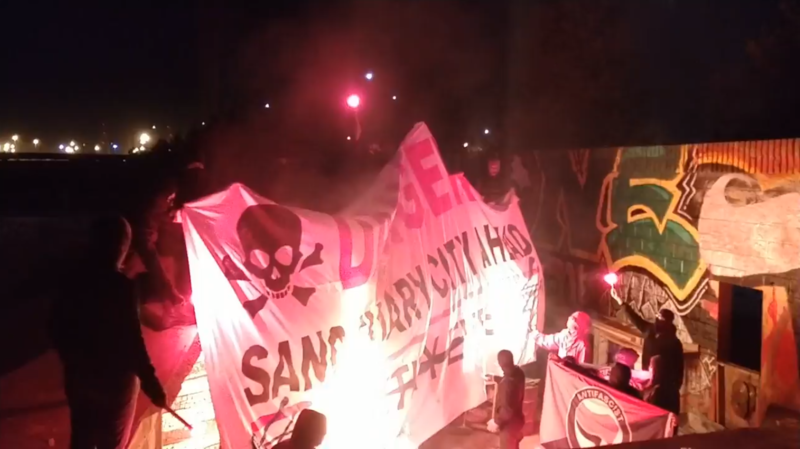 Communique: Bay Area Antifascists captured a banner that the white nationalist group Identity Evropa hung from the Yurba Buena tunnel heading into San Francisco. As a strike towards the defeat of our enemies, we tore down the banner put up in the early hours of the morning which attempted to “warn” commuters of “dangerous immigrants and refugees” and spread hate and fear of immigrants who call San Francisco their home. This failed attempt of evangelical xenophobia is coincidentally at the same site as a banner drop that was orchestrated by a Bay Area antifascist affinity group in November 2017. The antifascist banner, which (unlike this toy spot-jocking IE trash) remained in place for all of the weekday commute, declared “The People Want the Fall of the Regime,” calling for the demise of white supremacist capitalism on settled land. We refuse to settle between the terror of white fanatics like Dylan Roof, James Fields,and Jeremy Christian, or their ideologues like Identity Evropa. We will not accept the “sanctuary state” of Jerry Brown, nor continued ICE raids or Trump’s disastrous wall. We will take our collective liberation, and nothing less. Sanctuary is not given, it is carved out of everyone’s desire to be safe and free, and for that desire to be respected. Much like the banner removed and burned, we will take it upon ourselves to build a new world from the ashes of theirs. There’s no sanctuary in the bay for “alt-right” white nationalists or fascists of any tripe.